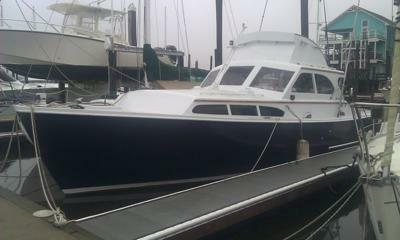 36' Egg Harbor Express Cruiser. 13'6" Beam. Hull construction: Mahogany plank over oak frame with fiberglass over hull below waterline. Twin 678 GM diesel engines. Hours on engines unknown. Engines were last started two years ago but the 8D batteries no longer have enough cranking amps to start them. 160 gallon fuel capacity with monel tanks. One monel water tank with estimated capacity of 30 gallons. Head/Shower hookups but shower has not been used. Full size bed, full galley, vberth in excellent condition. Boat has been used as a liveaboard for past four years. This is a project boat and the price reflects that. Serious inquiries only. Email LynCFB@gmail.com or call (910) 599-3168 with questions. This used to belong to Robb and Betty Tyler, and it is named after her. I have fond memories of outings on the Chesapeake Bay when it was Robb's newest boat. It was delivered in the summer of '59. We rode it up the Hudson in 1960 and decorated it with campaign balloons for Gore Vidal's losing congressional bid in 1960. Feel free to contact me via gmail. I used to live aboard one of these beautiful craft. It had some dry rot inside the cabin windows. The twin Chrysler Crown 125s could pull an oil tanker. She proved more than I had the means for back then. But, I will always love that boat. Am I missing the price? I do not see it.